Expand and Sync on your desktop with the SnapServer XSD 40. As a powerful local storage server, or node in a distributed enterprise deployment, the SnapServer XSD 40 can be configured in less than 30 minutes. With both block and file level access, the SnapServer XSD 40 has cross-platform compatibility with Windows, Linux, UNIX and Macintosh systems and is ideal for file sharing and storage consolidation. The SnapServer XSD 40 includes data protection features such as, DynamicRAID, high performance snapshots, and optional data replication. With support for SATA-II hard drives the SnapServer XSD 40 is scalable up to 24TB (4 x 6TB) for seamless growth. All SnapServer storage volumes are thinly provisioned and can be grown without limits or manual administrative provisioning. With the addition of BitTorrent Sync™ administrators can sync and replicate to other SnapServers for quick disaster recovery and also enable anywhere file access with any mobile device. Included are multiple back up features incorporating LTO tape, disk-to-disk backup, and RDX media, so you can ensure your data is available when you need it most. SnapServer XSD 40 0-Drives Custom Desktop NAS by Overland Storage Part# OV-XSD40-ND 4 Bay Tabletop Network Attached Storage. XSD 40 4 bay 0 Drive, add your own capacity WD RED HDD's select from 1TB through 8TB 4 Packs in the drop down menu below. SnapServer XSD 40 4TB (4 x 1TB) Desktop NAS by Overland Storage Part# OT-NAS200207 4 Bay Tabletop Network Attached Storage with RDX Integration via USB interface. 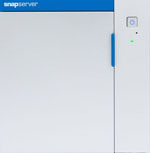 The SnapServer XSD 40 now available at BackupWorks.com. Capacity up to 16TB with 4 x 4TB. SnapServer XSD 40 8TB (4 x 2TB) Dektop NAS by Overland Storage Part# OT-NAS200208 4 Bay Tabletop Network Attached Storage with RDX Integration via USB interface. The SnapServer XSD 40 now available at BackupWorks.com. Capacity up to 16TB with 4 x 4TB. SnapServer XSD 40 12TB (4 x 3TB) Desktop NAS by Overland Storage Part# OT-NAS200209 4 Bay Tabletop Network Attached Storage with RDX Integration via USB interface. The SnapServer XSD 40 now available at BackupWorks.com. Capacity up to 16TB with 4 x 4TB. SnapServer XSD 40 16TB (4 x 4TB) Desktop NAS by Overland Storage Part# OT-NAS200210 4 Bay Tabletop Network Attached Storage with RDX Integration via USB interface. The SnapServer XSD 40 now available at BackupWorks.com. Capacity up to 16TB with 4 x 4TB. SnapServer XSD 40 20TB (4 x 5TB) Desktop NAS by Overland Storage Part# OT-NAS200228 4 Bay Tabletop Network Attached Storage with RDX Integration via USB interface. The SnapServer XSD 40 now available at BackupWorks.com. Capacity up to 24TB with 4 x 6TB. SnapServer XSD 40 24TB (4 x 6TB) Desktop NAS by Overland Storage Part# OT-NAS200229 4 Bay Tabletop Network Attached Storage with RDX Integration via USB interface. The SnapServer XSD 40 now available at BackupWorks.com. Capacity up to 24TB with 4 x 6TB. SnapServer XSD 40 1TB SATA w/Carrier Hard Drive Part# OT-ACC902022 Available at BackupWorks.com 1TB Add-on Drives for the SnapServer Desktop XSD 40 NAS Storage. Call us for a quote today at 866 801 2944 for all your SnapServer NAS needs. SnapServer XSD 40 2TB SATA w/Carrier Hard Drive Part# OT-ACC902023 Available at BackupWorks.com 2TB Add-on Drives for the SnapServer Desktop XSD 40 NAS Storage. Call us for a quote today at 866 801 2944 for all your SnapServer NAS needs. SnapServer XSD 40 3TB SATA w/Carrier Hard Drive Part# OT-ACC902024 Available at BackupWorks.com 3TB Add-on Drives for the SnapServer Desktop XSD 40 NAS Storage. Call us for a quote today at 866 801 2944 for all your SnapServer NAS needs. SnapServer XSD 40 4TB SATA w/Carrier Hard Drive Part# OT-ACC902025 Available at BackupWorks.com 4TB Add-on Drives for the SnapServer Desktop XSD 40 NAS Storage. Call us for a quote today at 866 801 2944 for all your SnapServer NAS needs. SnapServer XSD 40 5TB SATA w/Carrier Hard Drive Part# OT-ACC902048 Available at BackupWorks.com 5TB Add-on Drives for the SnapServer Desktop XSD 40 NAS Storage. Call us for a quote today at 866 801 2944 for all your SnapServer NAS needs. SnapServer XSD 40 6TB SATA w/Carrier Hard Drive Part# OT-ACC902049 Available at BackupWorks.com 6TB Add-on Drives for the SnapServer Desktop XSD 40 NAS Storage. Call us for a quote today at 866 801 2944 for all your SnapServer NAS needs.